This time last week, on Thursday 8 June, 32 million people casted their votes in the country's snap general election, which led to unforeseeable results. ITV Border reported live from a number of locations bringing you breaking news and reactions over night from the voting counts. Brexit negotiations must be put on hold and Theresa May must quit, Tim Farron has said. The Liberal Democrat leader said talks about leaving the European Union, which are due to start in 11 days, should be delayed while the new government reviews its priorities and sets them out to the public. Mr Farron, re-elected as Westmorland MP by the narrowest of margins last night, insisted there would be no deal to prop up a Conservative government, using Mrs May's own words against her by insisting "no deal is better than a bad deal". "Like David Cameron before her, our Conservative Prime Minister rolled the dice with the future of our country out of sheer arrogance and vanity," he added. Mr Farron said EU exit talks were "about to get very real" and warned the "consequences will be felt by every single person in this country". The dire result for the Conservatives showed Mrs May's "extreme version" of Brexit had been rejected by the British people, he said. "It is simply inconceivable that the Prime Minister can begin the Brexit negotiations in just two weeks' time. "She should consider her future - and then, for once, she should consider the future of our country," he said. "The negotiations should be put on hold until the Government has reassessed its priorities and set them out to the British public. "The British people have a right to expect that our Prime Minister will explain to them what it is that she seeks to achieve." The Lib Dem case for a referendum on the final Brexit deal "will only get stronger" as the talks continue, he claimed. 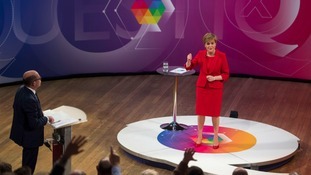 First Minister Nicola Sturgeon has conceded her plans for a second vote on independence were "undoubtedly" a factor as the SNP lost 21 seats at Westminster. In a dramatic night in politics, senior nationalists were ousted from the House of Commons - with former first minister Alex Salmond and SNP depute leader Angus Robertson among those who were defeated as the Scottish Tories had their best result in a General Election for more than three decades. She said Mrs May is making a "grave mistake" in trying to form a government and Labour should be given the opportunity to form a minority administration. Ms Dugdale also said First Minister Nicola Sturgeon should shelve plans for a second independence referendum after her party fought back to take six seats from the SNP. Election because the Prime Minister went to the country seeking a majority for Brexit - she has failed to get that. "I think the Prime Minister is making a grave mistake in ploughing ahead in seeking to form a government. "She only called this election seeking a majority. She should resign and Labour should be given the opportunity to form a minority government." On the issue of Scottish independence, she said Ms Sturgeon should recognise Scots have shown they do not want another poll. She said: "I think there's only one thing she can hear from the results overnight and that's that Scotland rejects her plans for a second independence referendum. "The one thing I would ask her to do is to shelve her plans for a second independence referendum. "That's my priority because I think that's in Scotland's interests first and foremost." Theresa May standing down as Prime Minister might hold the key to getting Government backing for a new nuclear power station in Cumbria. That’s the verdict of Rob Johnston, chief executive of Cumbria Chamber Commerce who says Government intervention to support Moorside is vital. He hopes that if May stands down in the near future, as some pundits are suggesting, her successor will be more pro-nuclear. We detect that Theresa May is less than enthusiastic about nuclear power. She hesitated over giving the go ahead for Hinkley Point and we were surprised that the Conservative manifesto made no mention whatsoever of nuclear new build. One of her closest advisers, Nick Timothy, is on record as being critical of Chinese investment in UK nuclear. Our position, set out in our Manifesto for Business, is that the incoming government must take a direct stake in the NuGen consortium to ensure Moorside goes ahead. Realistically, it’s unlikely that there will be an early decision – the new government will have other priorities – but it is vital for the UK’s energy security that the project goes ahead. The business leader is also urging Labour and the Conservatives to agree a common negotiating position on Brexit. Reacting to the General Election result, which saw the Conservatives lose their majority but remain the largest party, he said: “It is difficult to see how a government with such a slender majority will be able to enter the Brexit negotiations with any credibility or authority. “The answer is for the two main parties to agree a common position on Brexit, even if they can’t agree on anything else. He added: “Certainly, business doesn’t want to see a hard Brexit with export tariffs and barriers to recruiting migrant labour. Mr Johnston is pleased that “a potentially damaging second Scottish independence referendum is now very unlikely”. John Stevenson has held Carlisle for the Conservatives. It's his third term in the constituency, and he's pledged to get business booming. The Conservatives have won all three Westminster seats in the south of Scotland after David Mundell held the Dumfriesshire, Clydesdale and Tweeddale constituency. The Conservatives have gained Dumfries and Galloway from the SNP with a majority of more than 5,000. Rory Stewart has held Penrith & The Border for the Conservatives, with a comfortable majority. The Conservatives have won the Berwickshire, Roxburgh & Selkirk seat from the SNP. John Lamont, who came close in the previous two General Elections, beat Calum Kerr to claim it at the fourth attempt.